Third Time’s A Charm Baby!!!! According to Kim — Yeeeeehaw!!!! 😀 Sidebar — go check her out. She’s all kinda knitter/crocheter awesome and no, I’m NOT exaggerating. I don’t know how she cranks out those super intense projects so quickly. The woman is a machine!!! Now back to my “Precious” — there’s nothing else to say, I’m just going to let the F.O. speak for itself. It actually looks like a square. Thank you, thankyouverymuch! 😛 Now it’s on to getting some yarn together so I can do some granny square throw pillows for my couch. Seriously though, although I initially used these instructions, it was the pattern in this book that connected the dots for me. I did it with the new instructions 1 time and I was good to go. Modifications: Did three rounds instead of five. 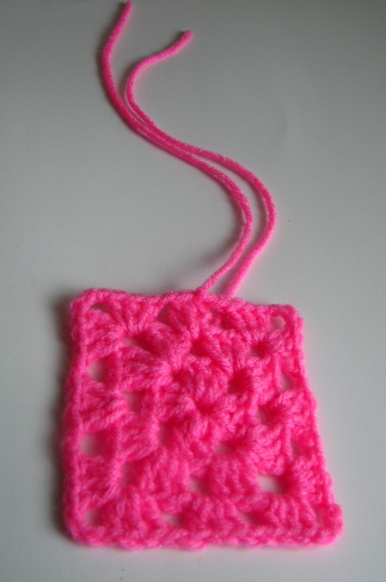 I can’t speak to any of the other instructions for stitches in this book but if the Granny Square instructions are anything to go by, I’ll say that I’m in for a treat! It’s crazy, I picked up this book on a whim for $5.99 at a local bookshop; so far it seems to be a gem. The reviews on Amazon about the book don’t seem to be very good, but for me so far so good. Next Article Stop Me, I’m A Monster Today!!! You’re doing great, and that’s awesome that the book helped you out! That books sounds like a keeper to me. It’s always nice when a technique clicks. Thanks Opal! That book was really helpful, I was surprised the reviews were so poor.